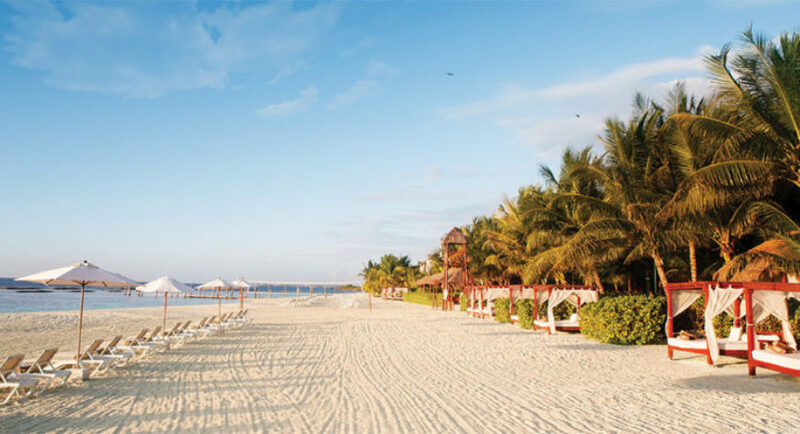 El Dorado Maroma, a Beachfront Resort by Karisma offers all the elements for an active, authentic and luxurious vacation experience. 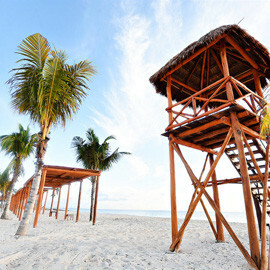 The resort is located on the renowned Maroma Beach, which is considered to be one of the top ten beaches in the world by independent reviewers, including Travel Channel. 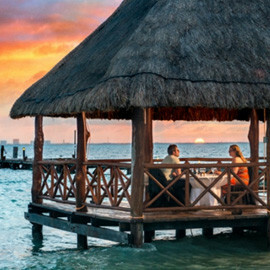 Along with luxurious features and amenities, you will enjoy Karisma’s exclusive Gourmet Inclusive® experience, offering stand out cuisine created by top chefs, gourmet services and amenities such as beach butlers, full concierge service, turn-down, 24-hour room service and premium beverages. This intimate resort with 128 suites is ideal for adults, ages 18 and older, seeking relaxation, personalized service, exquisite cuisine, romance and unforgettable adventures. * Contact your concierge for any further questions. 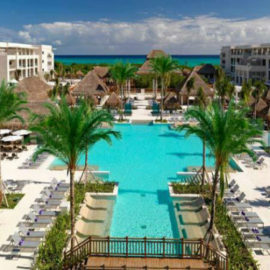 El Dorado Maroma is located on Maroma Beach in Riviera Maya, Mexico and considered one of the top 10 best beaches in the world by both Travel Channel and Discovery. 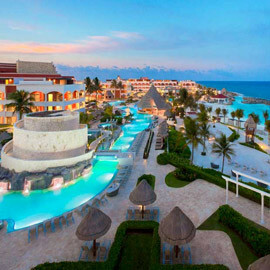 The resort is just 40 minutes south of Cancun Airport, 10 minutes north of Playa del Carmen, 15 minutes from Playacar Golf Club, and right in the heart of many of Mexico’s most exciting attractions. 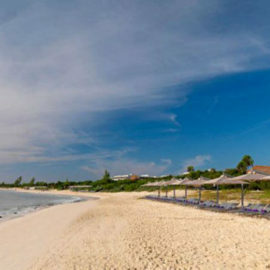 All suites and facilities at this beachfront property offer beautiful views of our lush tropical gardens or the stunning white sand and clear waters of the magical Maroma Beach. All suites are designed in a luxurious and contemporary Caribbean décor and are equipped with air conditioning, ceiling fans, cable TV, DVD/CD player, telephone, shower, hair dryer, make-up mirror, ironing board & iron, radio/alarm clock, safety deposit box, mini bar with beer, water and soft drinks that are refilled daily, coffee/tea maker and a comfortable oversized terrace with an outdoor bed where you can enjoy breathtaking views. With 11 categories available, you’ll find suites that stand out of the ordinary. 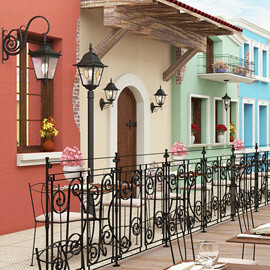 All of them provide the feeling of being at home, offering tranquility with a sleek and harmonious inspired design. 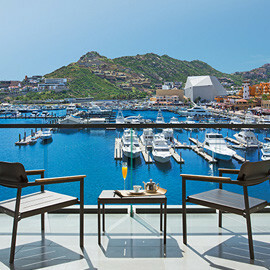 Romantically decorated suites in a blend of contemporary and authentic Mexican style feature a king size bed or 2 double beds, balcony or terrace, relaxing Jacuzzi, a marble top bathroom with double sinks, private toilette cabin and spacious closets. These suites are located near our beautiful beach, just steps away from a semi-private pool offering privacy in a quiet and tranquil atmosphere. Oversized luxurious suites with a beautiful view, featuring a private terrace with a double bed perfect for enjoying the romantic Caribbean scenery, these suites offer a King size bed, in-suite Jacuzzi for two, a comfortable living area and our exclusive “Aguas del Amor” outdoor shower. 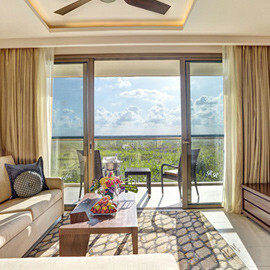 Surrounded by the unique beauty of nature in the Caribbean, our romantically decorated suites offer a king size bed and balcony or terrace, just steps away from a relaxing swimming pool and the gorgeous sands of Maroma Beach. 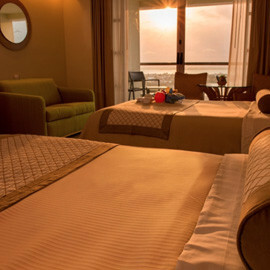 Our Royal Suites offer romance and intimacy with all the comforts and amenities, including a liquor cabinet with whisky, vodka, tequila and rum, a spacious bathroom and an oversized terrace or balcony that offers magnificent views to the ocean or the beautiful gardens. 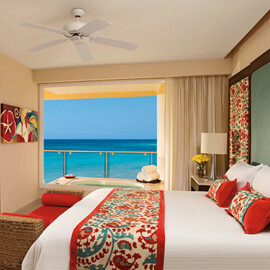 These suites offer the ultimate in privacy where you can enjoy the Caribbean scenery from your own private pool. These suites feature our lovely outdoor shower “Aguas del Amor”, romantic indoor Jacuzzi for two, Ipod Station, king size bed and comfortably decorated plush seating area that includes a pull out bed. 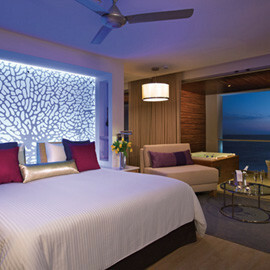 Enjoy our most luxurious suite; step right off your terrace into a lazy river that connects to the main pool with a unique swim up bar where you will enjoy fresh creations from our bartenders. 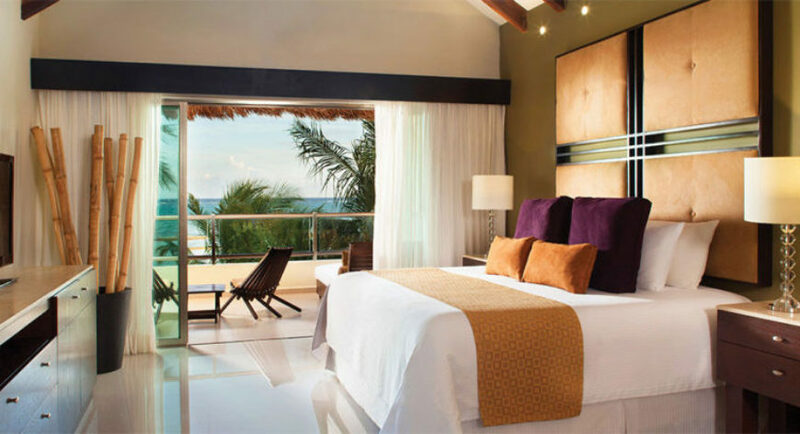 These suites feature a romantic setting with Jacuzzi for two, our lovely outdoor shower “Aguas del Amor”, king size bed, a comfortable living area that includes a pull out bed, Ipod Station and an oversized terrace with chairs. 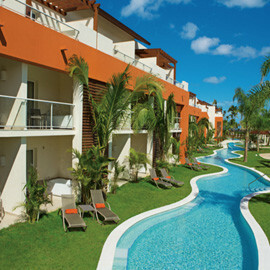 Luxurious suites where you can step right off to your terrace into the lazy river that connects to the main pool. This suite offers romance and intimacy with all the comforts and amenities from the Swim up Jacuzzi Suite plus a liquor cabinet with whisky, vodka, tequila and rum to enjoy during your stay. 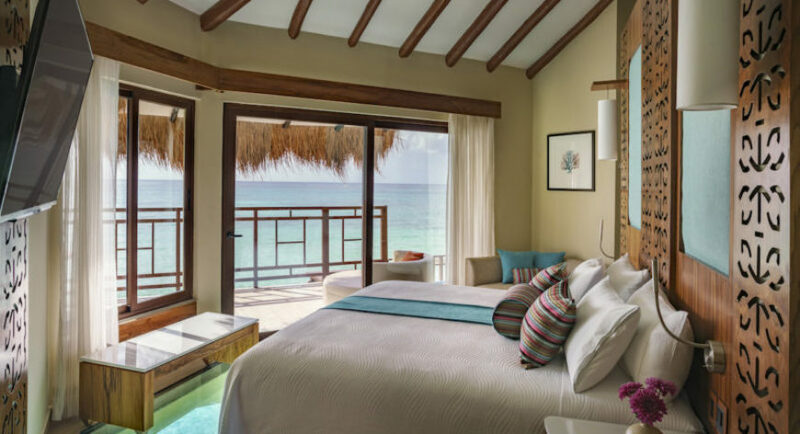 These suites are available with the spectacular views of our tropical gardens or the turquoise water of the Caribbean located just steps away from the beautiful Maroma beach and a semi-private pool. All suites offer a king size bed, living space, including an oversized fully equipped kitchen, ½ bathroom, a marble top bathroom with double sink, private toilette cabin, spacious closets and Jacuzzi for two. These gorgeous suites combine the comfort of home with an enticing blend of textures, patterns and colors, living space with an open floor plan; the ground floor will offer you a spacious living area, dining area, ½ bath, marble bar, modern kitchen with modern coffee machine, premium National and International liquor and beer, wine and a terrace with access to your private tropical gardens that features your very own cozy pool. The second floor features a master suite with king size bed, a master bathroom that includes a princess corner, double vanity, marble walk in shower, our famous outdoor shower “Aguas del Amor”, in suite Jacuzzi for two, private toilet cabin, spacious closet and a balcony that offers views to our lush tropical gardens. 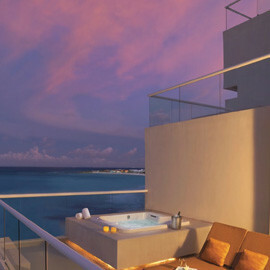 Inspired by your dreams, these harmonious two story suites feature a breathtaking view of the ocean. The ground floor features a spacious living area, dining area, full bathroom, marble bar, modern kitchenette with coffee machine, premium National and International liquor and beer, wine and an oversized terrace with access to your personal pool just a few steps from the powder white sand. The master suite, located on the second floor, features a king size bed, an oversized terrace with additional seating area and an outdoor relaxation bed where you can watch the sunrise. It also features a master bathroom with spacious closets, princess corner, double vanity, marble walk in shower, our famous outdoor shower “Aguas del Amor” and Jacuzzi for two to create the perfect ending to your evening. For your convenience, Butler Service will be at your disposal where the Butler will ensure your preferences are in-suite in accordance to the pre-arrival format and to assist you during your stay. 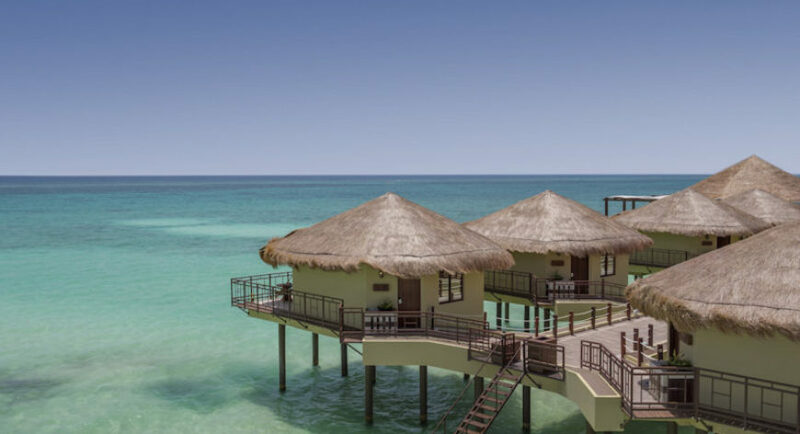 With a breathtaking ocean view, five spacious bedrooms and an abundance of luxurious amenities to delight the most discerning traveler, Villa Maroma offers the best in luxury vacations. The 10,500 square feet, two level home boasts plush, modern living spaces that blend seamlessly into 200 feet of exquisite tropical shoreline. The Villa features five contemporary rooms, three with king size bed and two with 2 double beds, a spacious living room that is perfect to enjoy the evenings, a dining room, a private Jacuzzi by the terrace and a spectacular pool. Guests enjoy daily maid service, turndown service and the care of a dedicated staff including a 24-hour butler service, executive Chef to assist with your meals, housekeeper, waiter, groundskeeper, gardener/pool attendant, 24-hour security guards and an on-call masseuse. A fully- equipped gourmet kitchen with all the modern appliances necessary to prepare meals for your event or for an intimate dinner is at your disposal. 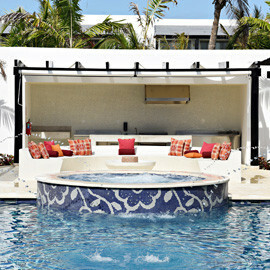 You may be inspired to prepare meals yourself or to take advantage of the pampering of the optional in-villa Chef. Microwave, refrigerator, oven, coffee maker and much more are all at your fingertips. CHECK-IN 3:00 pm CHECK-OUT 12:00 pm *All indoor facilities are non-smoking, but smoking is allowed in open air areas. 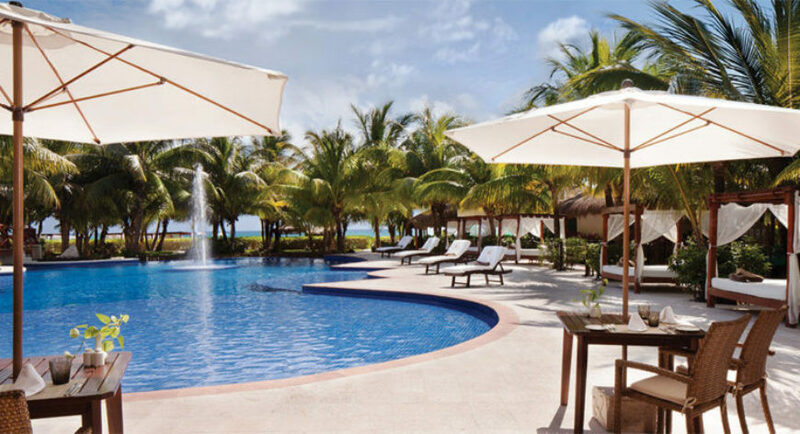 The á la carte restaurants, food display and bars at El Dorado Maroma combine a selection of the finest and refreshing cuisine and drinks in an extraordinary setting overlooking the renowned Maroma Beach. Sabores restaurant serves irresistible local and Caribbean specialties with an emphasis on authentic Mexican cuisine, spices and flavors. Delight your senses with our variety of dishes in a pleasant and casual atmosphere where our Chef uses the latest culinary techniques to make every bite an unforgettable experience. Kiyoko restaurant is a mystical combination of heaven and ocean. In this tasteful setting you will experience Asian-inspired cuisine served in the most creative ways. Sushi, Sashimi, and Teppanyaki are only some of the delicious mouthwatering dishes found on our menu. Kiyoko provides its guests with a very intimate dining atmosphere as well as chef interaction. This á la carte restaurant opens for breakfast, lunch and dinner offering our Gourmet Breakfast from fruit to eggs benedict. Lunch includes a variety of options including pasta, burgers, steaks and more. At night an intimate atmosphere is perfect to enjoy Italian specialties, using a traditional approach, Mio features creative cuisine from Italy’s sunny coastal and island areas. Enjoy a variety of Ocean Fresh Fish Carpaccio, Fruti di Mare and exquisite pasta among other succulent dishes with authentic ingredients in a relaxing and romantic atmosphere. 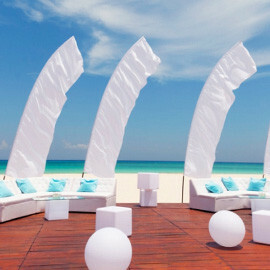 Sit back and enjoy the Caribbean lifestyle at this contemporary venue. 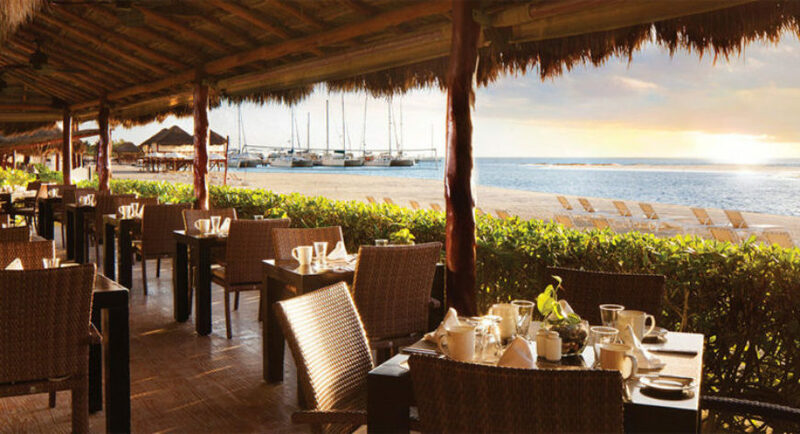 Our Chef’s create Mexican Caribbean delights in avant-garde style infusing the freshest local tropical ingredients. Enjoy the breeze on our open air terrace. 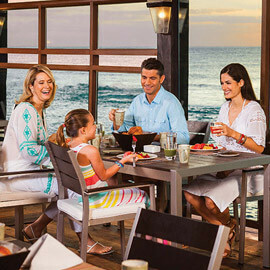 Experience a relaxing dinner or celebrate a special moment with your friends at the Chef’s table. *To ensure total comfort, some of our restaurants require reservations. Permitted: formal bermudas, dress sandals. Recommended: Dresses, skirts, long pants, shoes, capri pants, elegant sandals. NOT PERMITTED: Baseball caps, peaks, tank tops & flip-flops, sport shorts. Sweet Sunset: Coffee, Tea & Sweets. 5:00 pm – 6:00 pm. 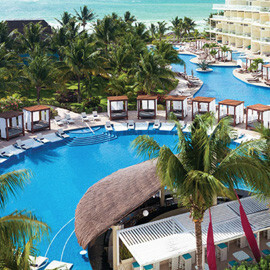 Located in the main pool with an exciting variety of Mexican beers and tropical drinks prepared by our professional bar tenders. Offering a wide selection of domestic and international premium brands, this classic lounge bar allows for relaxation and fun all in one. Rick’s Bar features our nightly entertainment, pool table and music. Non-motorized water sports: kayaks and paddle boards. 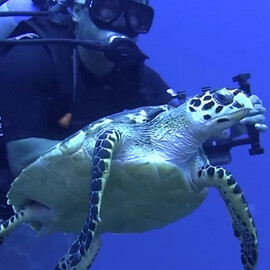 Special nightly entertainment includes karaoke, live music, circus show and more. 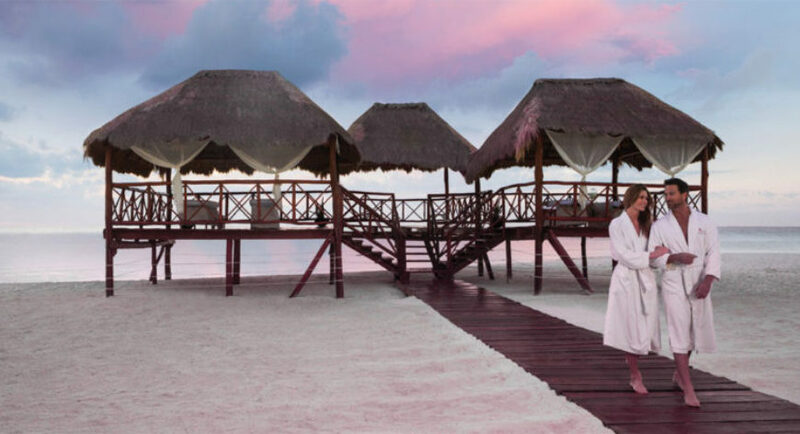 Enjoy of a Beachfront Massage in our unique over the water Palapa, known as Sky Massage. Massages: Relaxing, Anti-stress, Swedish, Reflexology and Hot Stone. Facials: Deep cleansing, Moisturizing, Age-defying, For Him. 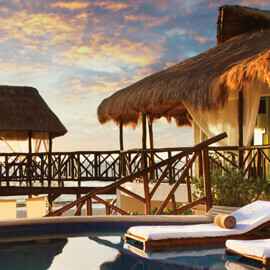 Luxury Body Treatments: Tequila Ritual, Holistic Treatment, Kakaw Body Treatment, Mayan Body Treatment, and more. Beauty salon: Make-up, Manicure, Pedicure, Waxing, Hairstyle and Haircuts.